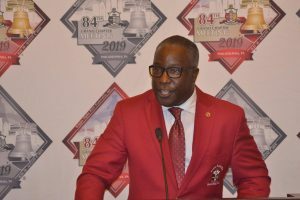 The Philadelphia Tribune featured the Press Conference to announce the 84th Grand Chapter Meeting & Conclave in Philadelphia, PA. 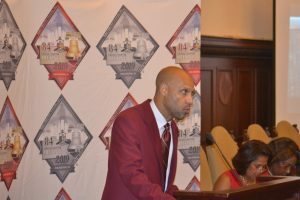 The Press Conference, Held on July 20 in the Mayor’s Reception room in historic City Hall, was hosted by Philadelphia Alumni and featured Grand Chapter Board of Directors, Grand Polemarch Thomas Battles, Northeastern Province Polemarch Craig Chisholm, Philadelphia Alumni Polemarch L. Douglass Harrell and former Mayor and Philadelphia Alumni Chaplain W. Wilson Goode. Conclave Planning Committee Chairman Sam Patterson kicked off the event and allowed his vice chair Joe Meade, Jr. to emcee. 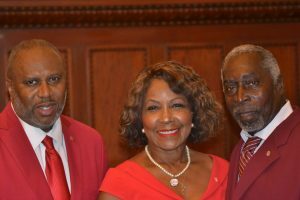 He started by indicated how honored he was to be involved in Conclave planning since his father, Brother Joe Meade Sr., then Philadelphia Alumni Polemarch chaired the committee in 1995 when the Grand Chapter Meeting & Conclave was last in Philadelphia. W. Wilson Goode blessed the occasion with a timely and hopeful convocational prayer. Province Polemarch Chisholm acknowledged the Presidents of the National Silhouettes and the Philadelphia Alumni Silhouettes. Julie Coker Graham, CEO of PHL Convention and Visitors Bureau, noted she is a silhouette and as a result was adamant in her pursuit to have Philadelphia host the 84th Grand Chapter Meeting & Conclave. The Basileus (President) of the Omega Omega Chapter of Alpha Kappa Alpha Sorority, Inc.® Carol Parkinson-Hall was in attendance as well. Councilwoman-at-large Blondell Reynolds Brown and Councilwoman for District 9 Charelle Parker both addressed the capacity event and noted their careers as teachers and long time membership in Delta Sigma Theta Sorority, Inc. Brother State Senator Sharif Street stood in for his father Brother Former-Mayor John Street and yielded the podium to Brother Steve Kinsey who noted he represented the area where Philadelphia Alumni is housed and sang a line or two from “The Year 1911” a performance he had long planned but judging from spot reviews jokingly summarized by Chisholm, had not adequately prepared for. 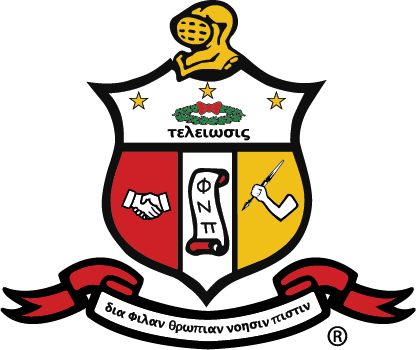 The city previously hosted three Grand Chapter meetings — in 1930, 1959 and 1995 — but next year’s meeting will be the first of the 21st century, according to the local alumni chapter’s website. The Philadelphia Alumni Chapter, located in Germantown, was founded in 1922 and is among the oldest in the fraternity. 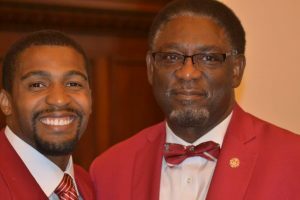 L. Douglas Harrell Jr., polemarch of the local chapter, said the Grand Chapter meeting will bring a significant philanthropic effort to the city, noting the fraternity will donate funds to the school district and give scholarships to students. Harrell added that the city itself contributes something, too. “The last one that was here in 1995 … the whole fraternity still talks about it,” he said. Among those at the announcement was Tarleton Williams Sr., a member of the fraternity for 69 years. Williams, 88, a member of the local chapter and Philadelphia resident, said he recalls the 1995 meeting, but the changing economic fortunes of the city, coupled with the innumerable restaurants, venues and hotels that have opened since then will ensure next year is something new. “It’s a different city,” he said. The event was judged a success by all attendees and followed by receptions at the Union League and Midtown Restaurant. The event was closed by Grand Polemarch Battles proclaiming “The Red Coats are coming”!